Other names: Common juniper, dwarf juniper, prostrate juniper. 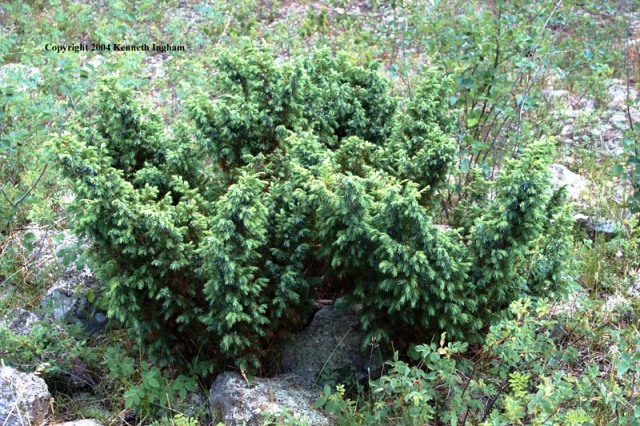 En is the form of common juniper that grows wild in the Southern Sweden. 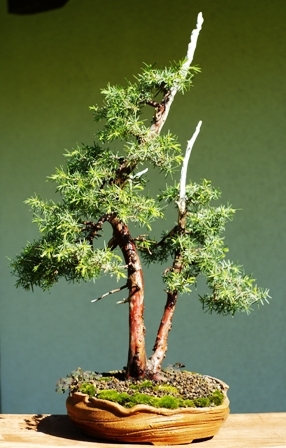 Common juniper is one of the most widespread conifers in a very wide range of habitats all over the world. When observed closely, there seems to be many variants of this species. En is probably a native of Sweden or Croatia. The present information is based upon the wild plants growing wild in Kristianstad area of Sweeden by Dr. Chiranjit Parmar during his stay as a Guest Scientist at the Division of Fruit Breeding of the Swedish University of Agricultural Sciences at Balsgard, Sweden. En has two very interesting features. Its tree, which is just 2-3 metres tall, is said to live for 600 years. Secondly the fruits which are just 6 to 13 mm wide, take 2-3 years to reach maturity from flowering. It may be the slowest edible fruit to ripen. Shrubs or small trees dioecious, upto 4 m tall (if trees, to 10 m), multistemmed, decumbent or rarely upright; crown generally depressed; bark brown, fibrous, exfoliating in thin strips, that of small branchlets (5-10 mm diam.) smooth, that of larger branchlets exfoliating in strips and plates; branches spreading or ascending; branchlets erect, terete. Leaves green but sometimes appearing silver when glaucous, spreading, abaxial glands very elongate; adaxial surface with glaucous stomatal band; apex acute to obtuse, mucronate. Seed cones maturing in 2 years, of 2 distinct sizes, with straight peduncles, globose to ovoid, 4-8 mm, bluish black with white bloom, glaucous, resinous to obscurely woody, with 2-3 seeds. The fruits collected from wild trees growing around Division of Fruit Breeding of the Swedish University of Agricultural Sciences at Balsgard, Kristianstad, were 6.9 mm long, 6.5 cm wide, 125 mg in weight and 0.145 ml in volume. The edible portion was 84.9 per cent. These contained 48.8 % moisture, 20.46% sugars, 0.314% tannins and 0.501% pectin. Their dessert quality was rated as “good”. Fruits are edible and can be eaten raw as well as cooked. En fruits are usually harvested in the autumn when fully ripe and then dried for later use. The pulp of fresh fruits is soft, mealy, sweet and resinous. The fruit is often used as flavouring in sauerkraut, stuffing, vegetable pates etc, and is an essential ingredient of gin. The aromatic fruit is also used as a substitute of pepper in some areas. An essential oil is sometimes distilled from the fruit to be used as flavouring. Average yield of this essential oil are around. The roasted seed is a coffee substitute. A tea is made by boiling the leaves and stems. A tea made from the berries has a spicy gin-like flavour. 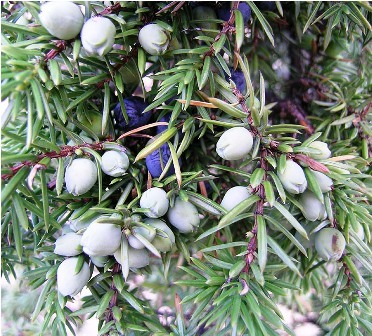 Juniper fruits are also used in herbal medicine, as a household remedy, and also in some commercial preparations. They are especially useful in the treatment of digestive disorders plus kidney and bladder problems. The fully ripe fruits are strongly antiseptic, aromatic, carminative, diaphoretic, strongly diuretic, rubefacient, stomachic and tonic. They are used in the treatment of cystitis, digestive problems, chronic arthritis, gout and rheumatic conditions. En trees are planted in gardens as specimen plants or for landscape use but not exclusively for their fruits. This fruit is easily propagated by cuttings. Seeds also germinate but the progeny may vary. So the varieties have to be propagated by cuttings only. Young trees are easily transplanted. But these are very slow to grow and sometimes the total annual growth is only a few centimetres. En trees can grow on all kind of soils. Once the trees are established, these require virtually zero maintenance. As already stated, the fruits take 2-3 years to ripen. There is also a choice of varieties at the nurseries.